Separate symmetrical IF inputs for FM or AM sound. Gain controlled wideband IF Amplifier input select Switch AGC generation due to peak sync for FM or mean signal level for AM. Reference Amplifier for the regeneration of the vision Carrier Optimized Limiting Amplifier for AM suppression in the regenerated vision Carrier signal and 90 phase shifter. Intercarrier mixer for FM sound, output with low-pass Filter Separate signal processing for 5.5 and 5.74 MHz intercarriers. Wide supply voltage range, only 300 mW power dissipation at 5 V.
This is one package pinout of TDA3856,If you need more pinouts please download TDA3856's pdf datasheet. 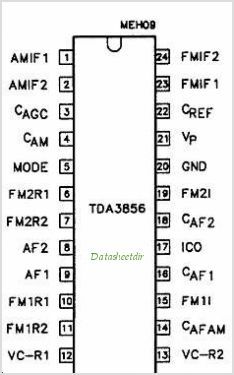 TDA3856 circuits will be updated soon..., now you can download the pdf datasheet to check the circuits!